Description Apply data dependent (AGC) and data independent gains to a volume. The Gain process generates a new volume with a scaling applied to the trace amplitudes. This process can be applied to any volume. – Scaling determined by the input amplitudes. – Can produce a second output volume of scalars. 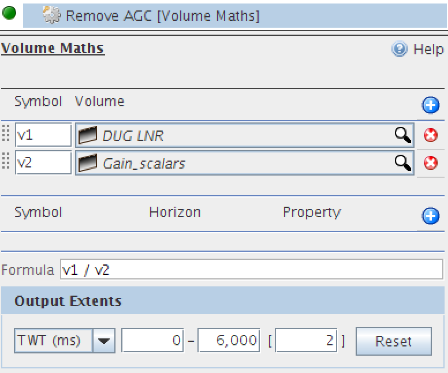 – Necessary to later remove AGC (using Volume Maths). – Scaling determined by time, velocity or other value. – Can be applied or removed. Click the Add icon and select New Process. In the Details Panel, at Volume, select the volume to apply the gains. 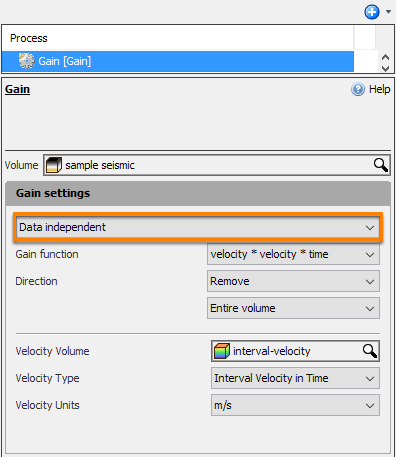 In the Gain settings section, select Data dependent (AGC). — The average of the window values (see Arithmetic Mean). — The median of the window values (see Median). — The geometric mean (nth Root of (a * b * c * d... n)) (see Geometric Mean). — The Root Mean Square / quadratic mean (see Root Mean Square). — Arithmetic mean of the middle N values in the window, where N is the window trimmed by the specified Percentage trim. Median mean, otherwise known as alpha-trimmed mean, is computed by ranking the values within a window from smallest to largest, removing the smallest and largest %, and averaging the remaining values. For example, a 40% trim would remove the smallest 20% and largest 20% of values, then average the remaining 60%. This is more robust (though more computationally expensive) than straight mean, as it is unaffected by outliers. 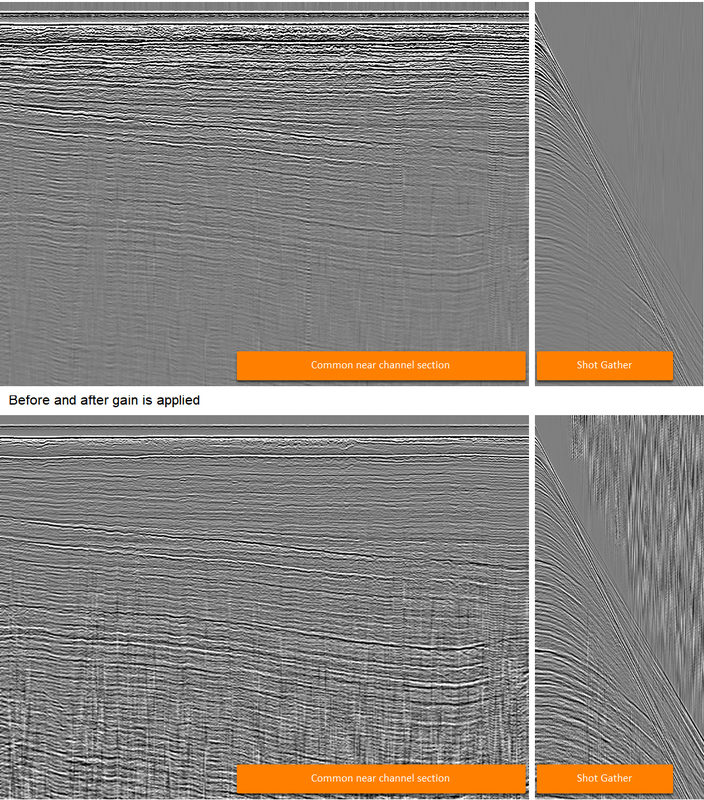 The Gain process also comes with a clipping functionality to clip scalars. 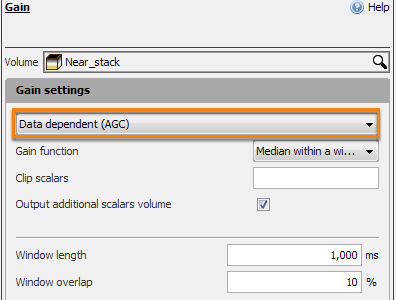 Select the Output additional scalars volume check box to produce a volume of scalars as the output, instead of the gained data itself. These can be applied to the data using Volume Maths (data * scalars), and later reversed (seismic/scalars) (see below). Enter the Window length and Window overlap. For each trace, a single scalar is calculated for each window, blended together in the area of overlap. As a result of this process, a new volume (with the same name as that given to the process) is available in the Volume tab. Tip: To quickly open the output volume, right-click the process and select Open Child Volume. Likewise, you can open the process from the Volume tab by right-clicking the volume and selecting Open Parent Process. 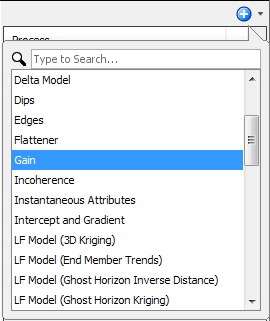 In the Gain settings section, select Data independent. Select Direction to Apply or Remove the gain. In all cases, the gain is normalised such that it is 1 at the first data point to which the gain is applied (this may not be the top of the trace due to windowing). The gain functions can be started and stopped at a specified horizon or constant time. In such cases, the gain at the bottom of the selected data range is applied to the remainder of the trace. Select Windowed or Entire Volume to apply the process within a defined window or on the entire volume. If Windowed is chosen, select Constant or Horizon to define the windows. If horizons are chosen, you can optionally input a constant to offset the horizon. As a result of this process, a new volume "Gain" is available in the Volume tab. If you are using a depth-domain input volume, you must have defined a velocity volume (see Converting Time-Depth) in order to use the Power of t, velocity * velocity * time, or Exponential gain functions. For windowed data (where top and bottom horizons are specified), the gain applied is always 1 above the top horizon, and the gain at the bottom horizon is applied to all deeper samples. A function of three user-provided constants: scale, power, and bias. ...where z is TWT in seconds (for a time-domain input) or TVD in km or miles (for a depth-domain input, according to the user's preferred units). Click the Add icon to add additional time/gain or depth/gain pairs. The gain function is a linear interpolation of the specified gain at the specified time/depths.